Dr Ruby Claudia Emily Davy. 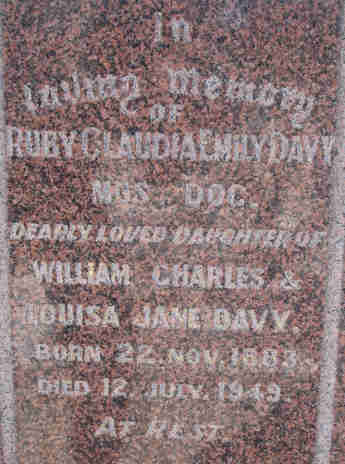 Ruby Davy was born on 22 November 1883 at Salisbury as the only child of William Charles and Louisa Jane Wade, nee Litchfield. Louisa Jane, through her father F.B. Litchfield, was a descendant of the Earl of Litchfield. From an early age Ruby was exposed to music as her mother ran the Salisbury School of Music and was her first teacher. At the age of 5 Ruby began improvising tunes and at 7 she composed short pieces of music with romantic titles. She proved a particularly gifted child and before long was helping her mother teaching young children, without neglecting her own studies at school and those of music and elocution. When only 9 years old she wrote a Cantata and two years later won a scholarship for senior pianoforte playing. At just 14 years of age Ruby won the Elocution Prize of the Literary Society's Annual entertainment at the Salisbury Institute and a year later had her own students. When 18 years old she had 27 pupils. With the support of her parents Ruby decided that she would like to further her studies and in 1900 she passed both the Junior and Senior practical and theoretical music exams of the University of Adelaide and Trinity College London. After her matriculation in such diverse subjects as English History, Literature, Physiology, Physical Geography, Geology and German, she enrolled at the Adelaide University and Trinity College for the Associate Degree of Music. She once again was successful and gained her degrees of both institutions in December 1903. Among the subjects she passed were acoustics, harmony, composition, musical history, fugue, canon, and instrumentation. To improve her practical knowledge of musical instruments she took up the study of the flute, oboe, clarinet, bassoon, kettledrums, trumpet, trombone and French horn. In 1907 the completed her studies for the degree of Bachelor of Music at the University of Adelaide. Somehow she managed to continue teaching at her mother's school as well as having a Studio at Allen's Music shop in Adelaide. Although she was a strict teacher and had high expectations of her students she also encouraged them to keep going. In return her students loved her and often bought presents for her after they had passed their exams. During her busy times of studying and teaching Ruby wrote compositions, many of which were highly acclaimed. In 1912 she scored another success when she gained her Associate Diploma of the London College of Music and started teaching for a short time at the Elder Conservatorium. She now often accompanied visiting examiners and musicians and gave her own recitals which sometimes included elocution items. In 1913 she started her biggest project, something which had never been done before by a woman in Australia. She began studies for the Doctorate of Music. That same year she also became the first person in Australia to become a Licentiate of the London College of Music. 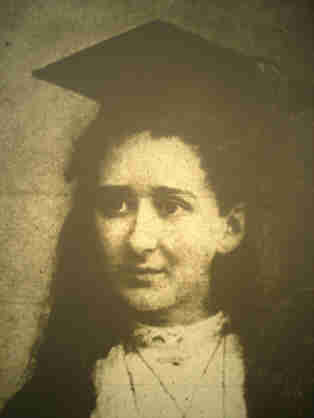 Ruby completed her studies and gained the Doctorate of Music in 1918. Once again a first for a woman in Australia. It was not only an honour to the University, which was the first one in the Commonwealth to grant degrees to women, but also the first one to grant a degree of Doctor of Music to a woman. Rounds of applause from all parts of the Elder Hall greeted Dr Davy as she received her parchment. 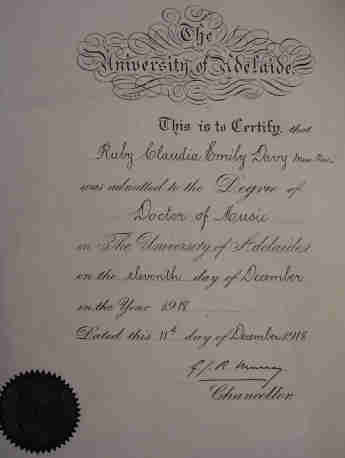 Her success was reported in the Mail which said, 'At the University Commemoration on 11 December, the Chancellor (Sir George Murray) paused before conferring the degree of Doctor of Music on Dr Ruby Davy, especially to congratulate her on being the first woman in Australia to attain this distinction. South Australia has therefore gained a high honour, as having been the birthplace of this accomplished musician'. The Adelaide University Magazine wrote later, 'She has had a brilliant career and we heartily congratulate her on her well deserved success'. As a pianist she was not only the first woman to earn this title, but also the first woman in Adelaide to gain a Doctorate in any faculty. Music authorities were unanimous that a more brilliant student had never completed an academic course. At the same time her ability as a composer and executant also received wide acclaim. Dr Davy was not the only gifted musician at that time. Other women who made their mark as exceptional pianists and composers were Elsie Hamilton and Maude Puddy. Although highly qualified in all aspects of music and the teaching of it and being able to play many other instruments, Dr Davy was never appointed to a permanent position at the University of Adelaide. At a time when women were still supposed to be at home looking after their husbands and children there was no need to seek a professional career. Those who did anyway were resented and often viewed with jealousy. A contributory reason could have been the fact that she had at times criticised the teaching methods at the Elder Conservatory. This would have annoyed its staff to no end, especially coming from a woman. Ruby was not one to sit on her laurels she kept up with her work, teaching and performing and gained still more distinctions. 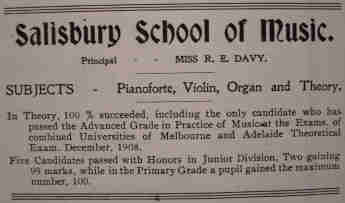 In 1920 she, and her mother, opened the Dr Ruby Davy's School of Music in Prospect where she had moved to with her parents the year before. In 1921 Dr Davy gained the Fellowship of Trinity College London, the first to be awarded outside England. This was followed six years later by an Honorary Fellowship of the Victorian College of Music London, again the first to be awarded outside England. Dr Davy was now an independent and financially successful musician, composer, teacher and performer. This all came to an end in 1929 when both her parents died at their home in Harrington Street, Prospect. Her mother, who had encouraged her so much passed away on 19 April followed by her father on 14 May. Ruby was devastated and after a nervous breakdown was forced to close her School of Music and cancel all engagements, leaving her without any income. For almost 5 years her life and career were in limbo. 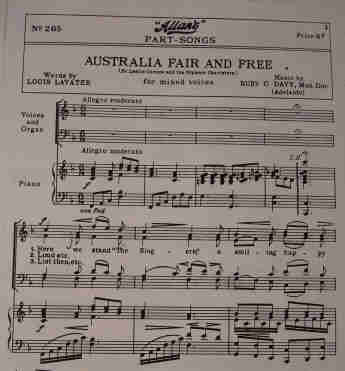 However at the Melbourne Centenary she introduced her 'Australia Fair and Free' composition and in October 1935 a recital of Dr Davy was broadcast on Radio 3AR. On that occasion she filled the roles of composer, conductor, solo pianist and accompanist. That same year she sold her home in Prospect and moved to Melbourne. Having regained her previous drive and zest for life she established the Davy Conservatorium of Music in South Yarra, offering all aspects of music and elocution. It turned out as successful as her previous school in Prospect. When South Australia celebrated its Centenary in 1936 she was back in Salisbury where the locals had organised a Gala Concert in her honour. Early in 1939 Dr Davy organised a three year lecture and recital tour of England, Europe and Canada. She departed in April and attended many performances in London before her own concerts would start in October. Even though WW II had started her performances still attracted capacity crowds. Between engagements she made several recordings with Decca Records and the BBC. In May 1940 she gave a recital in New York and later for the American Broadcasting Company. Her tour of Canada had to be cancelled due to the war and Dr Davy returned to Australia later that year. In 1941 Dr Davy founded the Society of Women Musicians of Australia and remained its President until her death. Unfortunately her home coming had not turned out what she had hoped it to be when she left. All her performances had been a great success but due to the war she had been unable to demonstrate her talents sufficiently to gain worldwide recognition and become a name in the overseas' music world. Financially it had been a disaster from which she did never recovered. She did open another School of Music, this time in St Kilda, but this time it was not very successful. With further financial problems and declining health, she died on 12 July 1949. 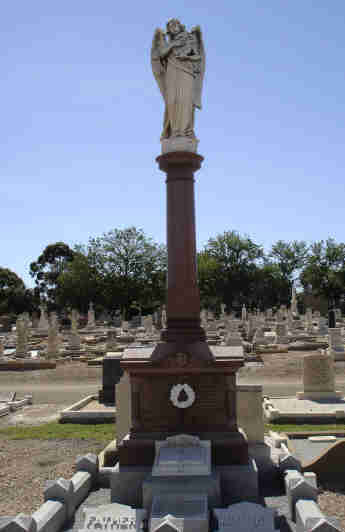 A memorial service was held in Melbourne and her funeral at West Terrace Cemetery where she is buried with her beloved parents. Ruby Davy, Academic and Artiste. and the 1978 thesis, 'A Portrait of Dr Ruby C.E. Davy' by Silvia O'Toole. The Salisbury Library has some of Ruby's papers and other items on permanent display.